A collection of Messages from Jesus, Blessed Mother, St. Thomas Aquinas, St. Michael the Archangel, and other saints about Purgatory. 58 pages, cover meaures 5"x7". St. Thomas Aquinas says: "Praise be to Jesus. I notice you have had many visits from Rachel - a soul once in Purgatory - now in Heaven. If you recall I once told you that every present moment is different for each person on earth - different crosses, different graces, different circumstances in every moment." 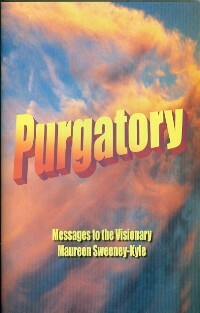 "It is likewise with Purgatory. Each soul's Purgatory experience is individual. Some suffer intense flames, some experience the purification of loneliness; others may have to endure burning of the tongue for lying about others or ruining someone's reputation. But every purification is presented in an individual way just as every cross and grace is particular to each soul in the world. Every soul in Purgatory suffers the greatest trial of being separated from God, however." "Jesus wanted you to know these things and to pass them on to others so as to bring to light the reality that Purgatory is real. It is like so many things God's Mercy and His Justice present together."